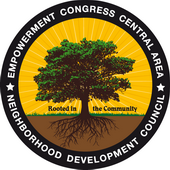 The Empowerment Congress Central Area NDC is a city-certified local group made up of people who live, work, own property or have some other connection to our neighborhood. Neighborhood Council Board Members are elected or selected to their positions by the neighborhoods themselves. Neighborhood Council Board size varies across the City from 7 to over 30 individuals depending on what the neighborhood believes will meet its needs. Currently, the Empowerment Congress Central Area NDC has 15 Board positions. We hold a regular monthly Community Meeting on the 4th Monday of each month and a Planning Meeting on the first Thursday of each month. We hold special meetings periodically and have working committees as well. Neighborhood Councils receive public funds of $37,000 each year to support our activities. This may include creating events and programs that respond to the unique needs of the community or advocating on behalf of the issues we care about such as crime, roads and streets, the creation of safe spaces for children, gangs, and economic development.